As part of my ongoing battle against the "Untrieds" section in my hoard, I thought it'd be good to feature older, classic shades once in a while- as part of a recurring segment on Polish Hound. I'll have more information at the bottom of this post. For Audrey is often described as the quintessential Tiffany-blue color (although that actual shade is apparently, bizarrely, trademarked by Tiffany & Co.). Anyway, it's a strongly green-toned lighter blue- maybe even a dusty seafoam, with a slightly faded/ desaturated quality. I'm open to suggestions here! It's possible I already own the polish you're interested in seeing (you can peep into my Stash here), but if not, I might even seek out the polish if feasible. (This is the Untrieds monster talking.) Bad monster. The polishes should be at least somewhat well-known in the nail blogosphere, and they should be at least a few years old, maybe 4 or 5 (~circa 2009 or before). And...they should be from commercial brands, since older indies are usually extremely difficult/impossible to find. I have a feeling the term "nailstalgia" is going to be making it's way into my vocabulary. I love this idea!!! I discovered Pinterest swapping a few months ago and have since gained a huge pile of untrieds. I think I might join in if you don't mind :) I just bought a mini bottle of For Audrey because it's one of those must have China Glazes that everyone talks about. My votes for the next polish are OPI Tickle my Francy or China Glaze Watermelon Rind. Wow that comment was all over the place haha! I can't believe it took me so long to wear it! Ah, those are both good picks! I have been dying to wear Wagon Trail, I'll have you know. :) Feel free to join! I think collecting more vintage-y polishes is really fun! I have never Pinterest swapped! That would be a whole new realm of collecting danger, probably. :) Every time I don't know what to wear, I pull out Tickle My Fance-y, but somehow I always choose something else instead! Good suggestion, and please join in! 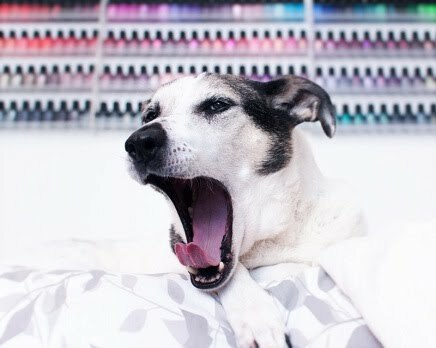 I'd be interested in seeing OPI Jade Is The New Black; it's one of those "you always see it" colours, but I'd love for it to get the Polish Hound Fabulous Swatch (tm) treatment. This is a great idea! My vote would be to see Black Cherry Chutney next, it's one of my all-time favorites! I love this polish & the idea of this segment!! I'd love to see Essie- Turquoise & Caicos next! this should be a weekly blogger thing, Nailstalgia is a great idea! you should set up a whole group for that - if you do, I'm definitely in!! I love Black Cherry Chutney! Ooooh, good pick! And thank you! Thank you! I don't know if I could keep up with a weekly thing, but I would love it if people used Nailstalgia as a tag or something. Hmmm. how about we set up a thing about that? I was going to do try to install a monthly "vintage"nail polish thing, but I'm much more interested in your Nailstalgia idea. Well, Nailstalgia IS basically semi-vintage polish, right? I'd LOVE to collaborate on this. Once/ month sounds about right to me. You can hit me at nailpolishhound [@] gmail.com to coordinate!